Delhi is a huge and sprawling city of almost 19 million people, more than the population of many small countries. However, today it is easy to explore Delhi through its wonderful metro network. This post is about an exploration of Connaught Place area of central Delhi around the Rajiv Chowk metro station. Rajiv Chowk station has two entrances, one near Pallika Bazar and the other in front of B block. There are two more metro stations in this area - Janpath and Barakhamba Road stations. This walking tour can also be carried out from these other stations. The image above is of a Buddha statue at the Cottage Industries Emporium on Janpath. CP was built as a commercial and business centre in early twentieth century under the British rule. Apart from some old and famous shopping areas and restaurants, a walking tour of CP also provides some cultural opportunities. In 1911, the capital of India was shifted from Kolkata to Delhi. At that time, the city of Delhi was mainly limited to Shahjahanabad (area around Chandni Chowk). Rest of the area which today comprises Delhi was composed mainly of Aravali hills with its forest. Towards its south, there were certain isolated inhabited areas - around the Dargah of Nizamuddin Aulia, around the water tank of Hauz Khas, around the ruins of Tughlakabad and in Mehrauli near Qutab Minar. Different areas of New Delhi were built by clearing the Aravali hills right upto Reading Road (now known as Mandir Marg). Today, a small strip of that ancient forest land of Aravali hills still remains between Reading Road, Dhola Kuan, Panchkuiyan road and Rajendra Nagar. The new areas built in 1920s included Connaught Place, Gol Market, Gol Dak khana, Viceroy house (now known as Rashtrapati Bhawan), India Gate and surrounding areas. On Reading road, the British had built the Harcourt Butler school (located next to Birla temple) for the children of the British officials, which used to shift to Shimla during the summer months. The Aravali hills, in the area where Connaught Place was built, included different villages and two famous temples - a Hanuman temple and a Jain temple. Both these temples are still present, close to Baba Kharag Singh road. Connaught Place was built in 1929-1933 as a series of buildings laid out in a circle around a central park with roads leading out like the spooks of a wheel. Names of many old roads of CP were changed after independence - for example, Kingsway became Janpath, Queensway became Parliament street, Curzon road became Kasturba Gandhi road while Irwin road became Baba Kharag Singh road. The civil contractor who had built Connaught Place was Shobha Singh, the father of well known Indian writer Khushwant Singh. The old shops in CP included Keventers and Wengers in A block. Wengers run by a Swiss couple, was famous for its chocolate cakes. In B block, Galgotias had a famous book shop. Mahatta, the celebrity photographer during 1940s to 1970s, had a shop in M block. The image below shows some of the celebrities photographed by Mahatta. After independence till the early 1960s, the area now known as Pallika Bazar, had a circular row of wooden shacks hosting the emporiums of different Indian states, while in its centre was the famous United Coffee House of Delhi where writers and artists of Delhi got together in the evening. As a child, I still remember an evening there with the well known artist Maqbool Fida Hussein. Later, the shops, emporiums and the United coffee house were shifted to new buildings on Janpath and Baba Kharag Singh road, while an underground parking and Pallika Bazar had taken their place. Across the road from Pallika Bazar, the iconic Jeevan Bharati building had come up in that area in 1980s. In the same period, a big fountain was built in the centre of the circular park in CP, with lights of different colours, and bathrooms underneath. During the summer months, this was a popular place for people to sit around and eat ice creams. Later this fountain was removed when the construction of the Rajiv Chowk metro station was started. The central park continues to be an important part of CP for the cultural performances. Because of the bomb threats, today the entry to the park is regulated through two entry gates and thus crossing the park as a shortcut to reach different parts of CP is no longer possible. Since 2014, the central park is also known for the giant Indian national flag put up across the entrance to Pallika Bazar. More than 60 metres high, the flag can be seen from far away and serves as a beacon for people in this area. Coming from the central park towards Baba Kharag Singh Road (BKSR), you can see two iconic buildings of this area - Regal cinema and Khadi Gramoudyog Bhawan. Standard restaurant at the first floor above Regal had opened in 1957, and for a long time, was known among the old-timers for its cuisine. On BKSR, on the right side of the road, you can visit the United Coffee House and the emporiums of different states of India full of handicrafts, clothes and other things. Each emporium is like a museum. On the left side, you can see Rivoli, another old cinema of this area and visit the old Hanuman temple which predates the construction of CP. The building between Rivoli cinema and Hanuman temple is Mohan Singh Palace market, famous for its tailors specialised in stitching of jeans. If you are looking for jeans made specially for you, this is the place to visit. The open area around Hanuman Mandir is a popular place for persons looking for a place to rest. Astrologers and those who predict your future by looking at your hands, sit here waiting for the clients. In front of Hanuman temple is an underground passage. Decorated with art, the passage hosts different handicrafts shops and an occasional exhibition. In the evening, I have seen parts of this passage used by young volunteers to teach the street children. The most famous group of constructions on Parliament Street (Sansad Marg) is Jantar Mantar, built in 1724 by Jaisingh Sawai II, the king of Amber in Rajasthan, who is also credited with the building of Jaipur. He had great interest in astronomy and astrology. Different constructions of the Jantar Mantar were built to study the movements of stars and planets. Similar complexes were also built in four other towns - Jaipur, Ujjain, Mathura and Varanasi. It has six constructions in brick and mortar, of which the biggest is known as Samrat Yantra. Across the road from Jantar Mantar is the new building of Pallika Kendra of New Delhi Municiple Council. It is an imposing building but is grey and anonymous looking. I think that it is a missed opportunity for making a building that could have been an icon for Delhi as well as a tourist attraction. The stretch of Parliament street after the crossing is used for staging marches and rallies. Free church at the corner is the meeting place for Alcoholics Anonymous. Being in the city centre, rallies here usually bring photographers and videographers from the newspapers and TV channels. The image below shows farmers at a rally in Parliament street. If you are interested in checking who all are doing sit-ins, protests and asking for their rights, turn left after Jantar Mantar on the Tolstoy Marg and take the Jantar Mantar lane on the right side. This whole stretch of road is reserved for people protesting against/for something. There was a time when Irom Sharmila was here. At another time, it was the site of anti-corruption protests out of which Arvind Kejriwal appeared as a political leader. Here are a couple of images about the protesters on Jantar Mantar road. Janpath is the road for shopping, from clothes to handicrafts. It has the Janpath metro station at the Tolstoy road crossing. Across the street from the Janpath metro station is Sarvanna Bhavan, the best place for south Indian food in CP. An important building in the same area is the Cottage Industries emporium (CIE) that is a treasure house of exquisite handicrafts, jewellery and clothes from different parts of India. It also hosts specific exhibitions regularly. Outside CIE, its lawns also host some statues linked with the exhibitions, like the sculptures in the image below. This old market is opposite E block in the outer circle of Connaught Place, on the left side after the crossing with Barakhamba Road. Once upon a time, this area had the first supermarket of Delhi called Super Bazar. Shanker market has literally changed colours over the past couple of years by asking local artists to colour its walls with beautiful designs. Legends say that this step-well was first built in the Mahabharat times. The present step-well was rebuilt by some Jain traders in the 14th century. 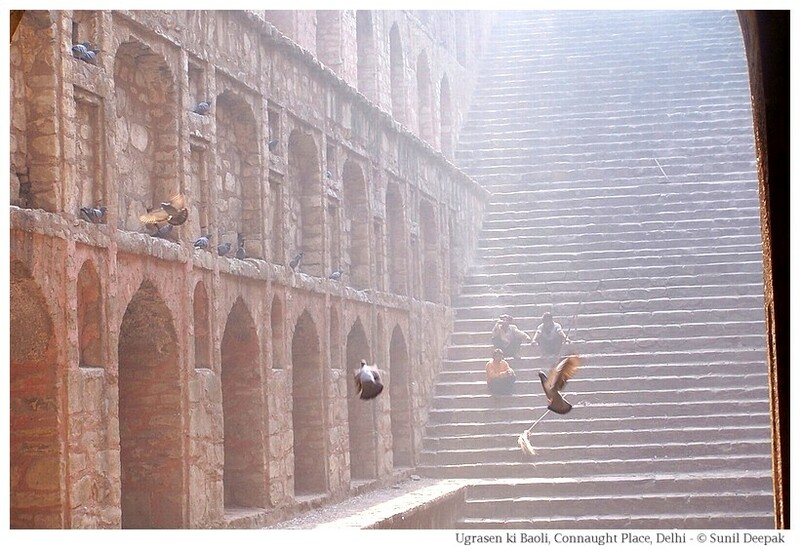 In style it looks similar to the 13th century Rajon ki Baoli stepwell in the Mehrauli archaeological area. Later a small mosque was added to the area. It is a beautiful, even if a little neglected building. Many films have been shot here including Rang de Basanti. During the times when the whole CP area was a rocky forest of the Aravali hills, this stepwell must have been a well known resting place for persons walking along the hilly trails. The ancient stepwell is hidden in a jungle of modern highrise buildings. To reach it, take Barakhamba road and then turn right on Hailey road, and again turn right inside Hailey lane. As a child, I had loved eating Dosas at Madras Hotel on Panchkuiyan road. Literally Panchkuiyan means "five wells". That name also refers to older times when this area was Aravali hills. Further down this road, closer to Karol Bagh, there are some old medieval ruins in the forest. Till 1970s and 1980s, Connaught Place was the real centre of Delhi. It was at Nirulas restaurant in L block where I had first tasted Triple Sundays, Pizzas, Hamburghers and Uttapams. I am sure that all the persons of my generation who had lived in Delhi, will have their own memories of CP. Today, Delhi extends to Noida and Gurgaon, on a grid that is more than 60 km long. Each area of the city has its own shopping centres, malls and multiplexes, while CP is known more for Rajiv Chowk, the metro station where you can change the metro lines. I am happy to take this trip down the memory lane to show some significant places of Connaught Place. Beautiful post and great pics. Thank you Guddu for the walk back in time. Nice information given about New Delhi and its major locality Images are very impressive and information is very helpful Thanks to share with us.